Zoroastrianism is of enormous importance in the history of religions. It became the state religion of the three great Iranian empires and influenced other world faiths: northern Buddhism and Judaism, Christianity and Islam. Mary Boyce is Professor Emerita of Iranian Studies at the University of London and is the author of a number of works on Zoroastrianism and Manicheanism. 5.0 out of 5 starsThe best book available for the understanding of this too often neglected major religion. There is not much books available about Zoroastrianism in English so this book by the eminent Iranologist Mary Boyce is a great start and valuable resource. This book covers not just the history of Zoroastrianism but also some of it's theology and background information crucial to understanding this obscure major religion. It contains 14 chapters starting from the prehistory of the Ancient Iranians to present day Zoroastrianism and it's adherents. Like mentioned before it also contains other valuable insights to Zoroastrianism. Although the book is scholarly in tone it is very readable and enjoyable. As Mary Boyce says in the preface that "Zoroastrianism is the most difficult of living faiths to study". Luckily, this book makes it seem just a bit easier. A clear, direct and to-the-point account of the history of Zoroastrianism. Well-written and meticulously researched. The best book I've read on this topic. For scholars, her companion book,"Textual Sources for the study of Zoroastrianism" is a very worthy addition. For amateurs, it's a bit heavy wading. Nevertheless "Textual Sources..." clearly shows the devotion and serious research that went into producing this book, "Zoroastrians". One thing she emphasizes is how heavily indebted Judaism, Christianity and Islam are to Zoroastrianism (and thus Mormonism, Sikhism and Baha'i are indebted as well). Well worth reading by anyone who really cares about religion and has an open mind as well. Were I able to give half stars, this would actually be a 3 1/2 star book, but I will round up. The title is a bit of a misnomer - while the beliefs and practices of the Zoroastrians are discussed at length, the organization of the text is more along the lines of a general history of the faith - its origins, evolution and parallel history of Persia. In terms of discussing the beliefs and practices of the religion, the first third of the book is outstanding as Boyce explains the origins and tenets of the religion, and how these beliefs were practiced in the early bronze age through the 5th century BCE. The parallels of Zoroastrianism on Judiasm, Christianity and Islam are clearly deliniated here as well. The middle third of the book (on the Selucids and Sassanids) was of less interest - I found it especially dull. The final chapters, from the 7th century CE to the present were interesting, if only to show the breadth and depth of the challenges the faith faced under Islam and European colonization. In terms of religious study, I wish Boyce had given greater attention to the syncretism between Zoroastrianism and the monotheistic religions of the Near East rather than merely discuss the broader similarities and have readers make inferences about them. As a history of the Near East through the lens of a particular religion, this is an outstanding text. The student of religions has few options when it comes to Zoroastrianism. Its scriptures have not been translated into English in over a century and there are vanishingly few scholars capable of dealing with the extreme philological and historical challenges of understanding and translating the material. Thank heavens that of the few books we have, Boyce's book is among them. Flawed though it may be, it is an invaluable overview of the history of Zoroastrianism from the time of its founder to the present day. Boyce did possess ample expertise to motivate and present the history and doctrines of Zoroastrianism in plentiful detail. Too plentiful, in fact, for the tastes of this reader, and I have a large appetite for dry academic material. Even so, plowing through this relentless presentation of technical terms, unfamiliar names, and obscure dynasties and languages was a daunting challenge, even at a short 200 pages. For all Boyce's lavish attention to detail she presents a surprisingly one-sided picture of Zoroastrianism. You would never know reading this book that the historicity of Zarathustra has been challenged repeatedly, or that opinions are sharply divided on whether or not Darius and his successors were Zoroastrians. Boyce has arrived at her conclusions and that is what you get. Her commitment to this interpretation goes too far at times and compromises her scholarly objectivity, as when she refers to the Zurvanites as betrayers of Zarathustra's doctrine and a "deep and grievous heresy". Such ideas simply do not have a place in academic scholarship. If we are to have too few books on Zoroastrianism in English, I am glad this one errs on the side of too much detail and minutiae. This book is the account of a scholar with very deep knowledge indeed, and I am glad for it, flaws and all. Mary Boyce's Zoroastrians is an historical overview of the birth, development, and ultimate withering away of this ancient religious community. 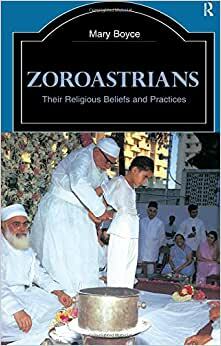 Laying the foundation of the religious culture of ancient Indo-Iranians out of which Zoroastrianism grew, she gives some basic but comprehensive details as to the Zoroastrian's religious beliefs (and some few facts about Zoroaster himself). A Monotheistic culture, with an angelic pantheon that in some respects seems polytheistic, Zoroastrians fight to maintain their belief in Ahura Mazda and the forces of good, which they believe is humankind's chief ally against the forces of evil, the Angra Mainyu. Although this book may be a bit in depth for introductory readers, to get beyond the basic facts of most world religion books, Boyce's book is a recommended read. Rich in historical detail, sometimes a bit thick and heavy, Boyce packs a lot into 230 pages.